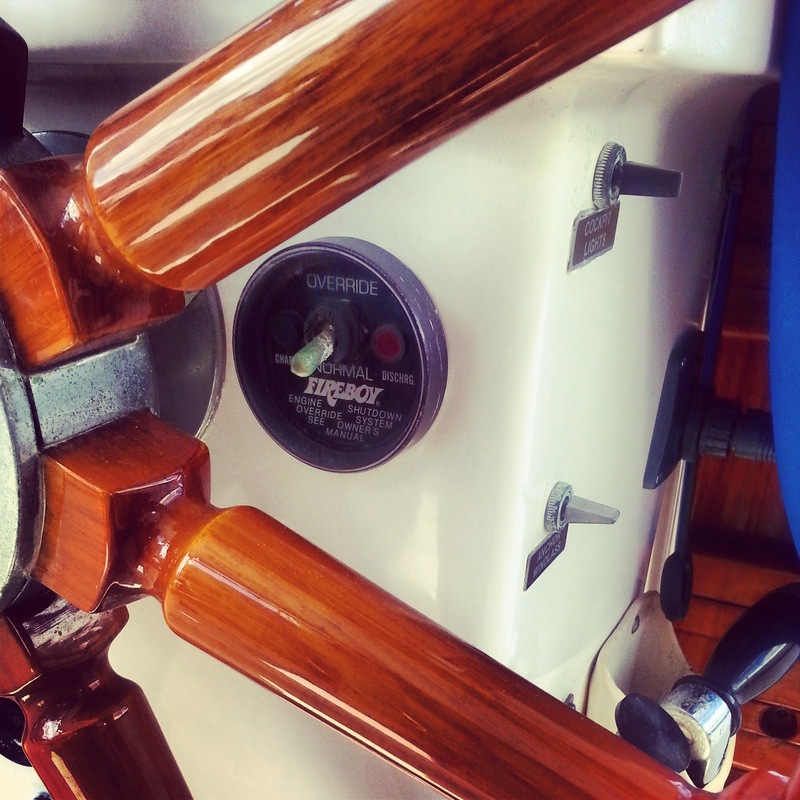 When we bought Sea Gem, we knew that it had an automatic fire-suppression system in the engine room called "Fire Boy." 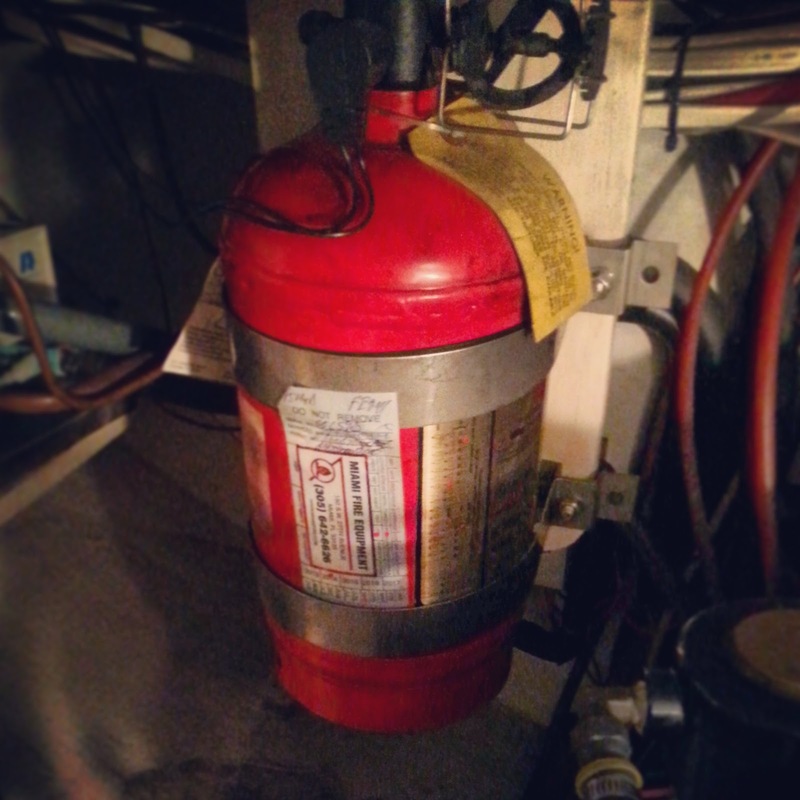 We previously wrote about Fire Boy in the context of things that needed to be Helina-proofed. We reasoned that, if she played with the various Fire Boy switches, she could set Fire Boy off and much inconvenience, damage, and expense would ensue. I had visions of the engine room covered in white foam and two dead engines (and a new engine costs pretty much as much as a new car). We recently had Fire Boy serviced by a technician who taught us how the system works, and as it turns out, our fears were somewhat unjustified. First, Fire Boy uses a "clean agent," not the noxious white foam I had envisioned, and it can't damage the engines. Helina, therefore, cannot hit a switch and cost us two new cars. Second, it is not as easy to set Fire Boy off as we had feared. 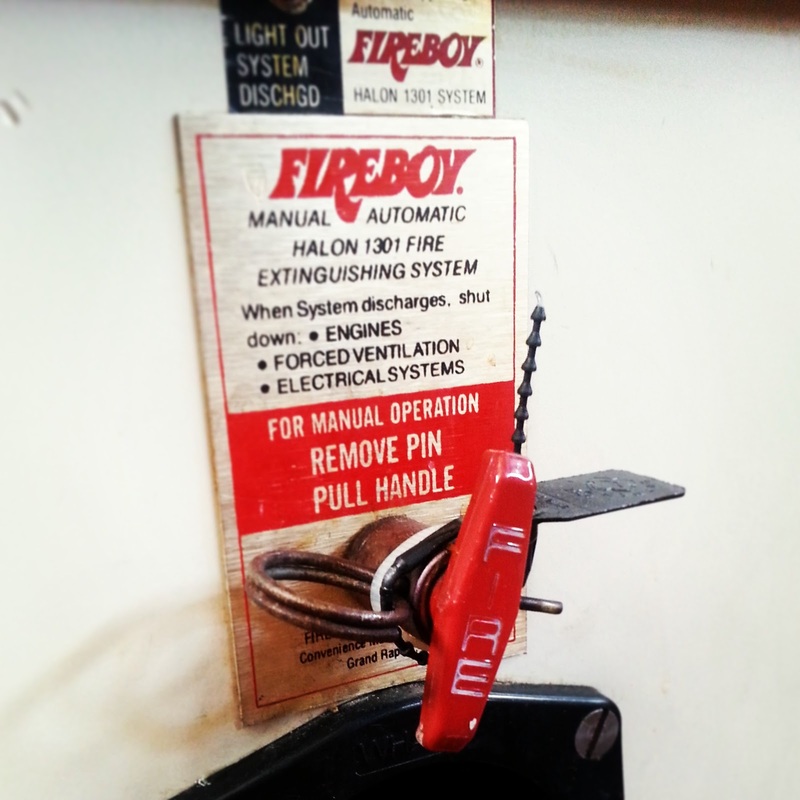 There is a pull switch near the galley marked "FIRE" that we assumed, if pulled, would set off Fire Boy. As it turns out we were right, but we secured the pin with a zip tie, and until she can reach the scissors, we should be fine. In addition, the pull switch requires a strong pull...stronger than Helina can muster, at least for now. So we're less worried about that pull switch now than before. The Fire Boy switch we were most concerned about was the green flip-switch located near the steering wheel in the main cockpit. No pin. No strong pull. Just a flip switch. We've worked very hard keeping Helina away from the green flip-switch. For nothing, as it turns out. The green switch cannot set off Fire Boy. Rather, if Fire Boy goes off (either by the pull switch or automatically if a fire is detected in the engine room), it automatically shuts off the engine, and hitting the green switch allows you to restart it. A neat safety feature, but in any case, Helina can cause absolutely no damage by flipping it. So, is Fire Boy still a concern for Helina? Definitely. If she sets it off, we need a new canister of whatever the "clean agent" is, and that costs $1,000. It's not the cost of two new cars, but more than enough to ruin our day. Of course, the risk of buying a new canister is far outweighed by keeping the boat safe in the event of a fire, so we'll continue to count as fortunate that we have Fire Boy aboard, but keep checking that zip tie. I'd worry more about the asphyxiation risk rather than the expense. How confident are you that your engine compartment doesn't leak air into the cabin? Thankfully, yes--sealed and vented only to the outside. Hopefully we won't need to test that out though!